Gustav III, born 24 January 1746, was King of Sweden 1771-1792. He was quite an intriguing King, often referred to as an "enlightened despot", a title that, on the surface, seems to be the ultimate oxymoron! How can one be truly enlightened and be a despot? When Gustav III became his he gathered his closest advisers and introduced a system of government giving him almost total autocratic dictatorship. This doesn't necessarily sound like a very good thing, but in the case of Gustav III, he used this power to attempt to create a better Sweden. And during his twenty-one year reign he was able to implement quite a few changes. 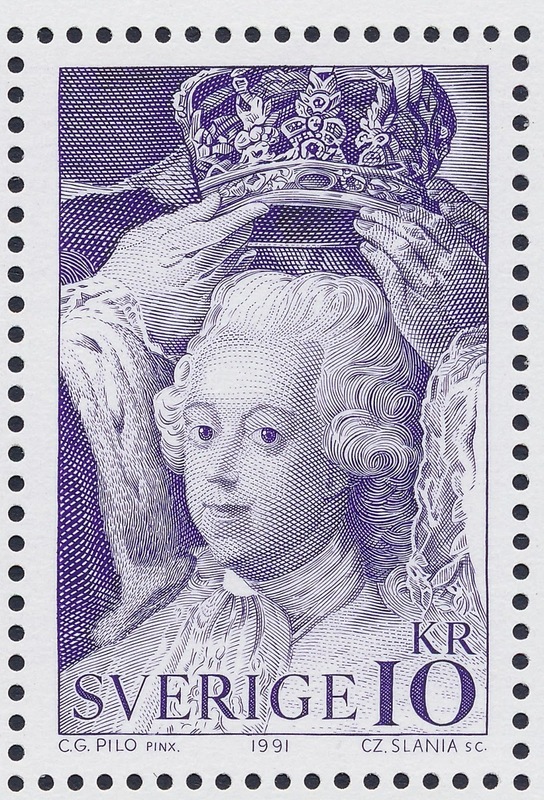 Gustav III was also a patron of the arts and literature. 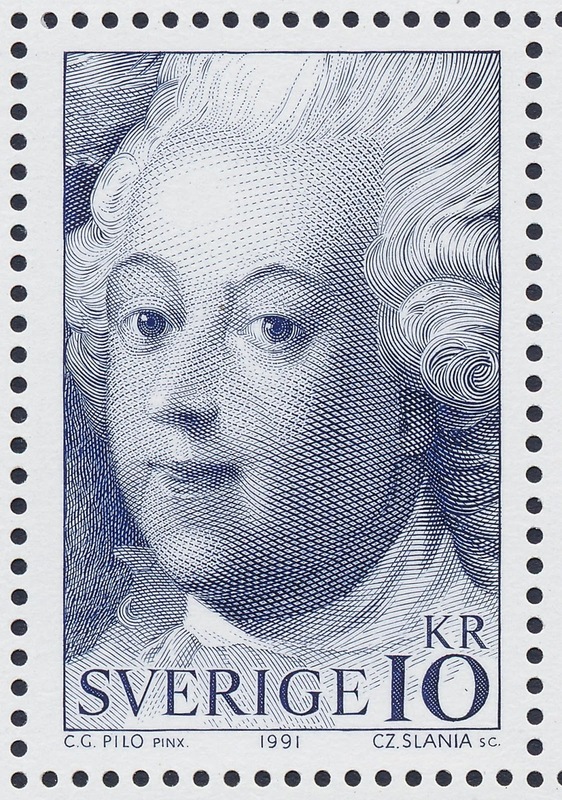 He founded the Swedish Academy and commissioned the construction of the Royal Swedish Opera. He also founded the Royal Order of Vasa, acknowledging advances in the fields of agriculture, mining, and commerce. But every great leader has a host of enemies. 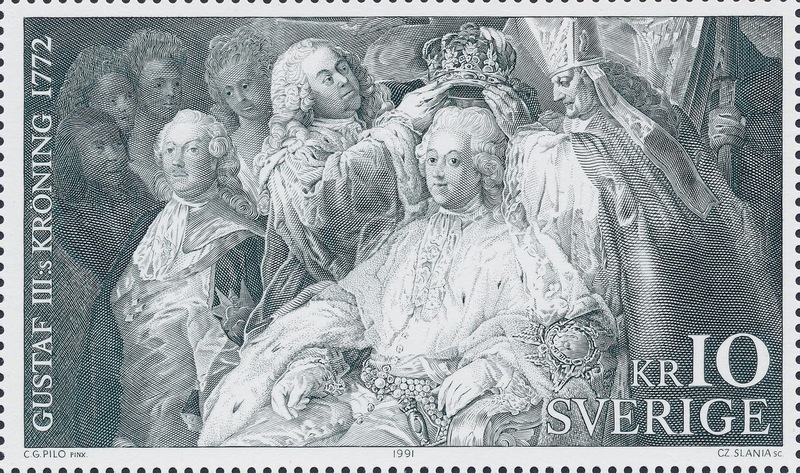 In the case of Gustav his enemies came in the form of a group of young nobles led by a 29 year old fellow named, Jacob Johan Anckarström, The king had withdrawn many of the privileges of the nobles, and he had dragged Sweden into a war with Russia (1787-1790) that they considered futile. Jacob Johan Anckarström and a bunch of his cronies got together to whinge about how poorly they had been treated. They decided that the king had to be done-away-with. So on the night of 16 March 1792 while the king was at a masquerade ball at the Royal Opera in Stockholm, Anckarström approached him and shot him in the back. The king did not die immediately. He survived for a further 13 days, all the while continuing to rule and, amazingly, receiving apologies from his enemies. Better late than never, I guess! Gustav III died of septicemia due to the gunshot wound in his back on 29 March 1792, at just 46 years of age. 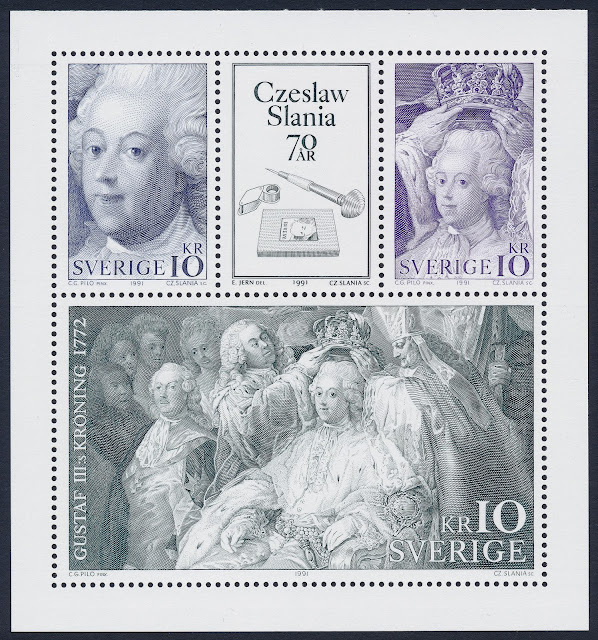 On 5 October 1991 for the occasion of Czeslaw Slania's 70th birthday, Sweden issued a beautiful Souvenir Sheet featuring the coronation of King Gustav III of Sweden. This Souvenir Sheet comprises four stamps, one of which is a special label. 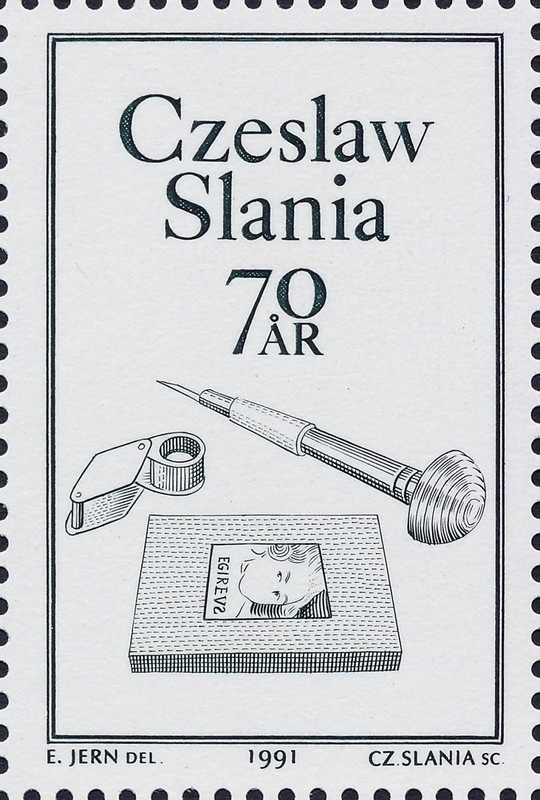 The entire sheet was engraved by Czeslaw Slania from a painting by C.G. Pilo. 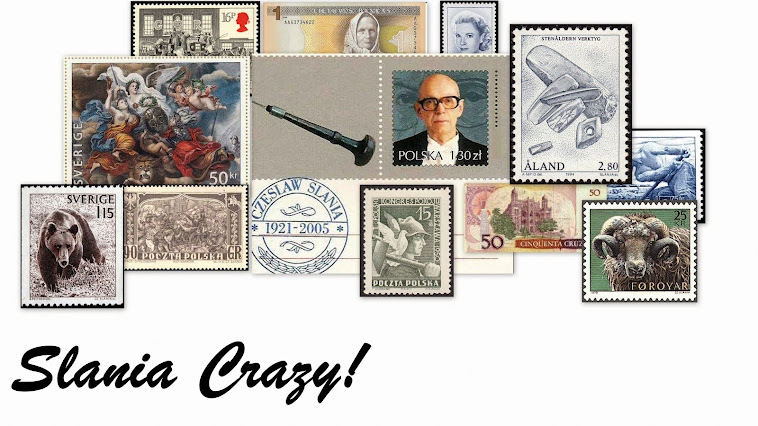 The Souvenir Sheet sold for 35k, the proceeds going to the benefit of stamp collecting. The details in this sheet are simply magnificent! 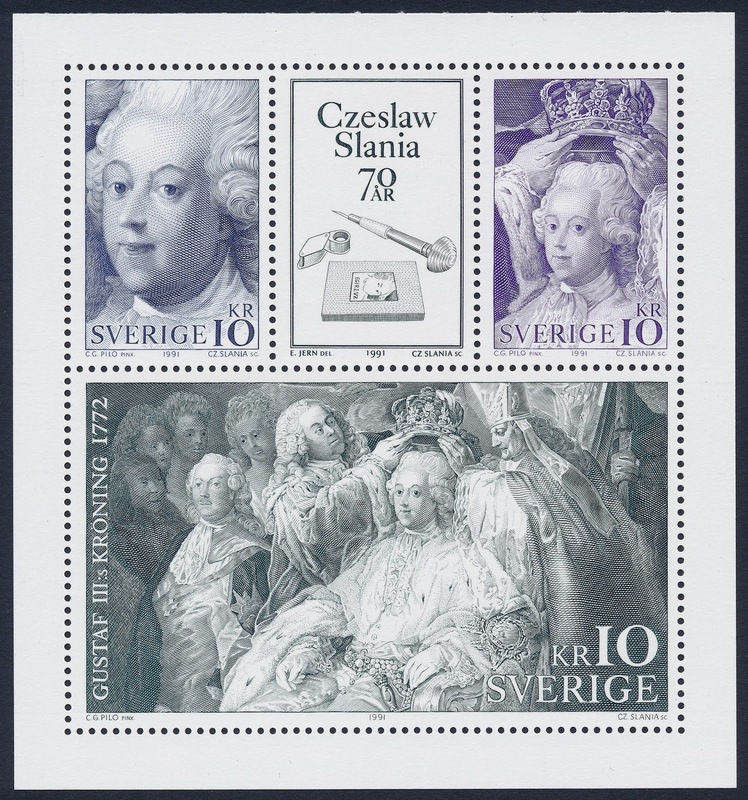 Note the stamp at top centre. This is the label mentioned above. Slania obtained special permission from the Swedish postal authorities to incorporate this label. The depiction of a burin, a magnifying glass, and a die, really set off the overall composition. Incidentally, the two stamps at the top left and right were sold as individual stamps. tres belle presentation Matt . Merci beaucoup, Lionel :) Ces timbres sont tres belle ! !